A crazy week at work made for some much needed quiet nights at home reading with the pup. We had a few things this weekend that are in the works and as soon as something is set in stone, I can't wait to share!! But it may take away from my reading time, so a little nervous about my hope to read 213 books in 2013! Political Suicide sounds like an intriguing book, as does Y. What a strange and intriguing title. Enjoy reading! 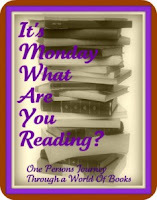 Find out what I'm reading this week! I can't wait to read The Good Daughter...I loved the first one. I'm waiting for my copy of The Truth About Love and Lightning to arrive - it looks really good.